Some time ago you got the chance to take a closer look at the Kingdom of Svedonnia and its various places of high importance. Today you'll get to do the same for Puffington Empire, the home of my Freeguilders. 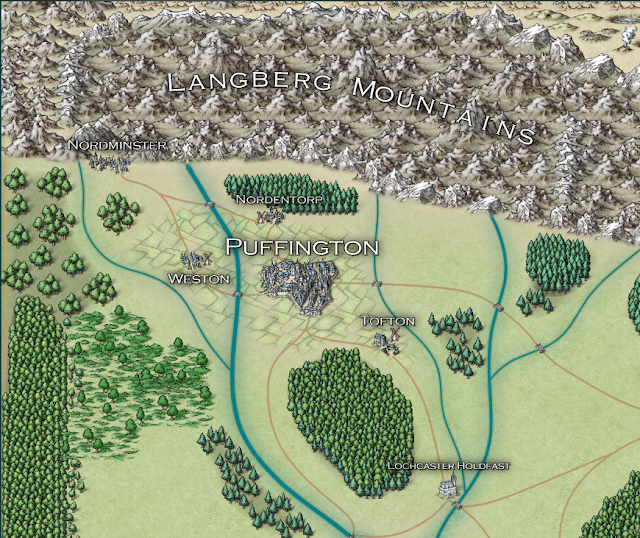 The Puffington Empire, a vast and powerful domain of humans and their Order allies in the Realm of Ghur. Spreading out in between the Steidolon Sea and the Langberg Mountains, this bastion of order has thrived for centuries and still remains one of the most powerful regimes in the area. Founded at the dawn of Age of Sigmar by courageous settlers who travelled in the wake of the God-King's Stormcast Eternals on their re-conquest of the Realm of Beasts, the various settlements and strongholds now house a plethora of inhabitants from all kinds of aelves and duardin to humans from all walks of life. The Scarlet Sentinels Warrior Chamber that reclaimed the land from Chaos has long since continued on, but they still keep a small force in the capital to help maintain order and monitor the growth of the nation. Despite the diversity of the settlers, humans have always born the brunt of the Empire's protection. Freeguilds annually draft soldiers from the realm's human population to join the companies and battalions that see to the protection of the lands forts and borders, with occasional excursions into other parts of Ghur should need arise. Each settlement maintains a good number of Freeguild Guard at all times for law enforcement and patrol duty, and these garrisons can be reinforced by voluntary militia from other races in times of great peril. 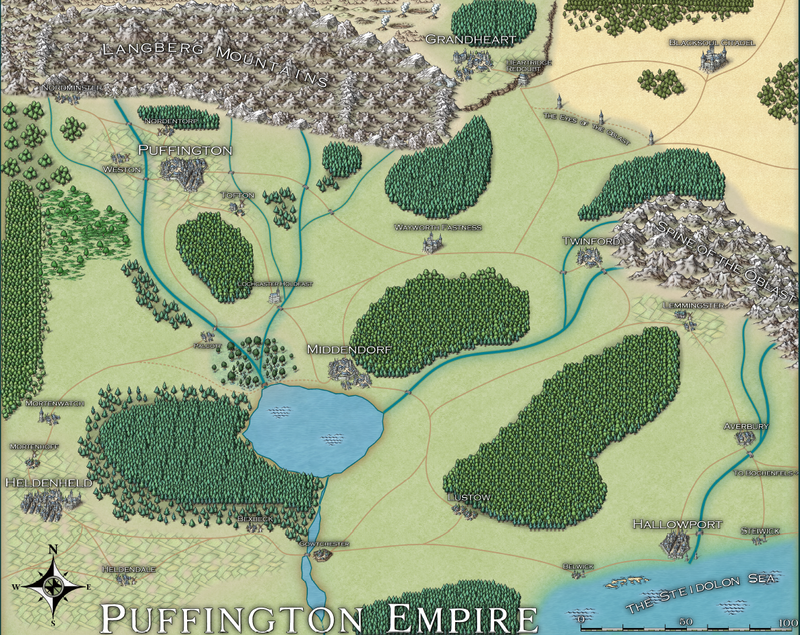 The Puffington Empire is run by a cabinet of politicians representing the various groups and factions within the cities. They hold their weekly meetings at the Hall of Liberty in the capital, Puffington, to attend to matters that arise from the ranks of the citizens as well as seeing to the day-to-day paperwork an empire of this size requires. Although most of the members of the cabinet are humans, proof to the fact that each group and faction is entitled to its own representative and humans have lots of them, the greatest power is still wielded by aelves and duardin. Humans are among the most short-lived creatures among the population, so their advocates and political alignments are prone to swift changes, whereas the elder races can drive their ambitions in the cabinet decade after decade. This stout political lining and the immense experience of their politicians gives aelves and duardin a clear edge in honing the empire to their liking; the conscription of humans to do the fighting is but one of many such achievements already in practice. Hallowport is the seaside gateway into the Empire. A bustling city with high walls and a deep harbour, Hallowport is a safe haven for travellers and the nexus where streams of goods from the sea and the land intertwine. Metals, weapons, lumber and wine are sent off to distant lands whereas jewelry, spices, tools and "rare products" are imported and sold off further inland. A steady flow of merchants, adventurers, craftsmen, mercenaries and refugees flocks the harbour every day, with dozens of ships arriving and departing from the carefully guarded docks that spread out along the shore as far as the eye can carry. Belwick and Steiwick are small fishing villages along the Steidolon coast. The waterways to these two minor settlements are treacherous and shallow, meaning that only smaller ships and boats can dock there. Due to more solute traffic supervision in comparison to Hallowport, these villages are favoured locations for smugglers and other practitioners of illegal trade. The locals are mostly humans and aelves, fishers and shipwrights who don't give a rat's arse about who passes through their settlement as long as there's a chance to make profit out of it. Averbury is a walled town built on a crossroads between Lemmingster, Hallowport and Bochenfels. It solemnly guards the bridge leading east, the vigilant soldiers of Averguild patrolling the length of the river and tolling travellers and merchants seeking to cross the bridge or sail upriver. Tolls are not the town's main income, however, as the vast grasslands around Averbury lend themselves well to herding cattle. Looming and tailoring are common professions among the town's inhabitants, and the empire's nobility often closely follow the ebbs and flows of Averbury fashion to make sure they wear the latest and most fashionable garments at any given time (which, of course, are all made in Averbury). It is noteworthy that many of the local clothmakers and sewers are, or work directly under, aelven tailors who know their trade better than any human could ever wish to learn. Trade and traffic from Bochenfels to the east have sadly ceased altogether now, with the city overrun by the greenskins of Waaagh! Urgokh. This has had a clear impact on Averbury's economy, and the mass of refugees saved from Bochenfels by duardin Thane Morek Furrowbrow have only caused more trouble as the city now stands on the brink of a serious supply crisis. Lustow is an insignificant village at the south end of Belwood. The settlement consists of a cluster of log houses and half as many sawmills and stockpiles, as the entire dwelling was founded to house the region's woodcutters, hunters and foresters that make a living out of the great Belwood stretching out into infinity just beyond the village's unguarded perimeter. The work is hard and the atmosphere in the village is gruff and unwelcoming, but there's good silver and gold to be made in selling timber and firewood across the empire. Lemmingster is the breadbasket of Eastern Puffington. Owned by the famous and respected Lemming family, the lands around this peaceful town are riddled with farms and fields from horizon to horizon and are the main source of food for the eastern empire. The current head of the Lemming family, Lord Warwick, acted as the Governor of Bochenfels and recently perished along with the city. His eldest son Richard was also in the city, learning to handle economy and politics in his father's court, but went missing during the evacuation. For now all the power of house Lemming is held firmly in the grasp of Warwick's wife Anne, who grows their youngest son Edward to become the next head of the family. Heldenheld is the breadbasket of the west. A huge city built in the shadow of Heldenfort, a sturdy citadel that watches over the lands and provides protection through its seven battalions of freeguilder regulars that are up and ready for a scrap at any given time. Together with smaller villages of Mortenhoff and Heldendale this seething settlement takes care of the fertile lands around it, producing such massive amounts of food that there's always more than enough to sell away, either inside or outside the Puffington Empire. Mortenwatch is a minor town, its main feature being nothing more than a tollhouse along with a watchtower. Any trade entering the Heldenheld region from the north traverses through here, paying the toll to go on. From the watchtower a guardsman can spot approaching caravans half a day before they actually arrive, such is the size of this tall brick-and-timber contruct. Gowchester guards the eastern passage into Heldendale region. Like Mortenwatch it tolls caravans and travellers that trek through, using this income to fund weekly boat patrols up and down the river. The settlement is walled and upkeeps a considerable standing force of handgunners and cannons to protect the river, as this waterway leads straight into the large lake in the heartlands in the middle of the empire. Middendorf is the second largest city in the region, its main livelihood consisting of river trade and artillery. The settlement itself is a thriving city surrounded by immense walls with cannon emplacement pointing to all four winds, and the prospering trade of casting artillery pieces for the freeguilds has started a rapid expanse in the recent years. New buildings are built with such speed that nearly half the city now resides outside the safety of the battlements, but so far the population has had great faith in the artillery mounted upon them. Along the river shores multiple foundries belch out black smoke that covers the sun on all but the most windy days, as the Middendorf industry pumps out cannons, helblasters, rockets and steam tanks for the armies of the realm. Needles to say most of the foundries and workshops are run by duardin artisans, with dozens of duardin and human workers spending their days in the scalding heat of the furnaces. The representatives of these Arsenal Guilds have vast power in the Puffington cabinet. Palcott is a tiny village just north of the dark swamps that cap the heartland lake. The settlement is only alive thanks to the road that travels through here, as the land is too poor to farm properly and the trees here are too twisted for anything but firewood (and even then they smell funny). A smaller path bypasses Palcott and crosses the river deep in the swamp, but this way is shunned by the right-minded and it is mostly used by outlaws and smugglers. Many who trek the road disappear only to be found dead downstream several days later. 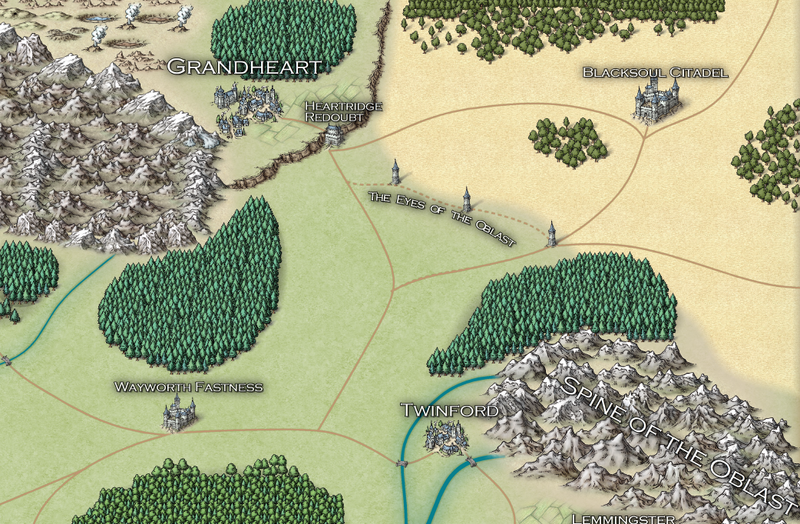 Puffington is the largest city in the empire and acts as its capital. This humongous metropolis is fed and supplied by three minor towns called Weston, Nordentorp and Tofton, all of which make good use of the riverland soil surrounding the capital. The rivers flow wild and create natural barriers that protect the city from outside threats, funneling any would-be conquerors through one of the five heavily guarded bridges that allow passage into the region. Despite being well protected against foreign armies, a city of this size is also direly threatened by enemies from within. The insane labyrinth that is the Puffington sewer network is impossible for patrols to navigate, so the underground system is infested with all kinds of mutants, lowlifes and worse. There are also many districts that guardsmen avoid if at all possible, either housed by arrogant aelf nobility, grumbling duardin longbeards or simply organized criminal gangs. Several dark cults are uprooted each year and evil schemes are thwarted daily, but none can say how many such enterprises remain undiscovered as of yet. The size of the settlement has its drawbacks, but it also means many of the most important imperial institutions are located here. The Hall of Liberty, where the cabinet holds its meetings, stands proudly next to the main central square. The Imperial Military Academy of Puffington, several embassies from other reigns of Ghur, Collegiate Arcane Observatory and Grand Temple of Sigmar are but a few examples of the most notable buildings in Puffington. The populace consists of a rich mix of different races, and from the wide streets to vast forums throngs of aelven goldsmiths, duardin silverworkers, tanners, thatchers, cobblers, rat-catchers, merchants, doctors, charlatans and members of countless more professions ply their trade each day. Lochcaster Holdfast keeps vigil over the Lochcaster Bridge, the largest, strongest and widest of all the five crossing that allow entrance into the Puffington region. This stronghold is responsible for monitoring the river and land traffic up here in the north, and no wagon or boat can get past the numerous checkpoints and patrols that make sure nothing shady can get up from the south. In case of open war, Lochcaster Holdfast is responsible for blockading the river to deny the advance of enemy ships northward from the heartland lake. Nordminster is a town heavily marked by religion. Although the Grand Temple of Sigmar resides in the capital, the Nordminster Abbey, Shrine of Valaya, Anvil of Vaul and other holy places of other deities of Order besides the God-King himself are located here to avoid vast pilgrimage crowds in Puffington. The Nordminster Abbey is the tallest building of the settlement and it is dedicated to worshipping different human saints, as the dictations of the cabinet have decreed that the human population may not build a separate shrine for each of their saints (many of which were created during the recent re-conquest of Ghur). This abbey is where all the members of the cabinet are nominated annually with grand ceremonies, so despite being a monument to the oppression of humanity for some, this building along with its human proprietors has great signifigance and political power in the realm. Grandheart is the cradle of learning in the empire. Led by elder human mages, grumpy duardin runelords and sage aelven loremasters, scholars from all three races carry out research and investigation on just about anything in the universe. The Mountaintops to the west of the city are topped with observatories, the city itself is dotted by workshops and laboratories and the forest neardby acts as a silent place for meditation and nature magic. The ancient craters to the north provide a plentiful supply of rare minerals and ingredients that the alchemists and mages use for their projects, and many of the settlements "regular" occupants forge out a living by harvesting these resources. With the latest inventions and discoveries in the field of agriculture at their disposal, the locals have even managed to farm the plains they occupy hundreds of feet above the waterline. Little thought is put to the defense of the city, as this task has been delegated to the Heartridge Redoubt. This holdfast is both a castle and a straiway up unto the plains of Grandheart, as it is the only way to enter the region. Cannon batteries and strange magical contraptions sprout from its walls of enchanted stone, manned by aelf, duardin and human alike. This is a notable exception to the norm across the empire; the garrison has a mixed force of regulars, all born in Grandheart, that spend their entire lives guarding the cradle of knowledge that is their home and place of birth. Wayworth Fastness dominates the plain fields in the middle of the Puffington Empire. Its well-equipped freeguild garrison keeps the roads safe, and a cavalry company of aelven volunteers is maintained for pinpoint raids into the dark forests of the region and as swift reinforcement should the Wayworth Regulars get into trouble too big for them to handle. Any trade caravans and travelling merchants are given a chance to repose here, in living quarters reserved for just such occasions. This is as much for the safety of the travellers as for the chance to check the merchandise and see if the tolling papers are done correctly. Twinford's population lives on river trade, fishing and mining. The nearby mountain range holds precious minerals and ores that are put to good use in Middendorf foundries and Grandheart workshops, keeping this settlement rather well fed on the income their production provides. 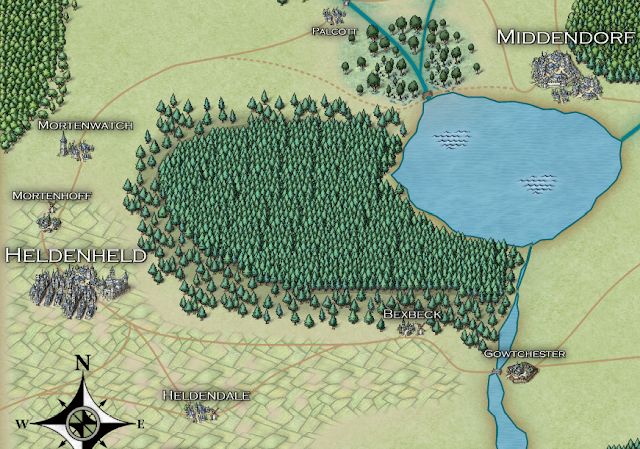 With the presence of Wayworth Fastness and the natural protection of the rivers, Twinford has little need for a garrison aside from a standing regiment of well-trained crossbowmen. Blacksoul Citadel stands proud in the great nothingness that is the Oblast. These endless steppes are home to many peoples and strange beings, both friendly and hostile, yet its size is so unfathomable that only rarely does anything appear on the horizon if one stares out from the battlements. The Blacksoul Citadel guards only a single far corner of these endless steppes, the corner that leads into the Puffington Empire. Trade rarely passes by, save for a couple of persistent merchants that accompany the supply deliveries in hopes of selling something to the grim folk of the garrison. Only humans man the walls of this stronghold, its living conditions so harsh that the cabinet sees them fit only for the men and women of the empire. Here serves the famous regiment known as the Blacksoul Pike, renowned for their skill and determination at defending the fords and chokepoints of the steppe's crags and streams against intruders. In additions to cannons, swords, pikes and crossbows the citadel maintains several troops of Pistoliers, sons of young nobles seeking to prove themselves, and Outriders, men of all sorts seeking to escape their former lives by serving at the edge of nothingness. The Eyes of the Oblast are a series of watchtowers spread across the fringes of the steppes. Should anyone or anything get past the vigil of the Blacksoul Citadel, the Eyes will deal with it or send for reinforcements from the south. Many aelves voluntarily serve at the Eyes of the Oblast, their keen eyes a great boost to the otherwise human garrison, not to mention their swift steeds or unerring aim with a bow. Rumours abound of a minor human regime out in the Oblast, a faction in constant war with the marauder tribes that plague the steppes. These nomads are said to have their towns and villages spread wide, each of them walled and manned by hardened warriors. Some say they live most of their lives in the saddle, their skills at horsemanship equalling those the aelves at the Eyes of the Oblast. Of course the pointy-eared watchmen wave these rumours off with their pale hands, claiming that it is purely a fable told among lesser races to keep their hopes up.